Finally A Wireless Qi Car Charger That's Safe, Durable & Keeps Your Phone In Place At All Times! We understand that consumers want an easier way to keep their phone charged while driving without having to deal with the annoying hassle wired chargers are known for. Well, not anymore! Our wireless mount car charger works with any Qi-enabled device that supports wireless charging which makes charging your phone as simple as putting it down - it's really that simple! Charging Your Phone Will Never Be The Same Again! Using state of the art Nano-Technology, this wireless device charger can deliver 9V/1.1A to allow your phone to charge faster! Using a smart chip for auto detection it automatically recognizes your device to optimize the current output to provide the right current to Charge Fast, Prevent Overheating and provide short Circuit Protection! 1. Our Nano Suction Car Charger won't just keep your phone safe while charging but will also keep you safe by keeping your hands free and your attention on the road. 2. The Magnetic base attracted by the Iron Ring stuck to the Dashboard, Will keep your phone in place while you drive so that you don't have to worry about it falling over when you hit a bump. 3. Using the durable Carbon Steel Ball, you can swivel and rotate your phone to view it from any angle making it perfect for GPS use. 4. The Nano Pad Charging Surface provides optimized current output enable fast charging for your phone. 5. Works with all Qi-Enabled devices which all include all devices which include iPhone X, 8 Plus, Samsung Galaxy S6/ S6 Edge/Note 8/S8 Plus/S7 and more! ✅ FAST WIRELESS CHARGING: Made using state of the art 9Volts QI technology and high-quality materials, our wireless car charger for phones is made to provide you with a simple and convenient solution to charge your Qi-enabled Devices while your drive and keep them in hindsight. Simply place your device on the wireless charging Nano Pad to start charging or use it to charge at your office, home or anywhere else you want. ✅ SAFE & SECURE: This wireless phone car uses a smart technology chip charger to automatically recognize the device to provide it with just the right amount of current to prevent overheating, overvoltage and short-circuit making so that you can use it without having to worry about any harm coming to your smartphone. ✅ USE IT ANYWHERE: Our 2-in-1 Nano Suction QI Wireless Car Charger is made to provide you with a simple and quick way to keep your phone charged without having to deal with annoying wires. Thanks to our Wireless car charger with the magnetic base can be used on your cars Dashboard, at your Office Desk, Nightstand or any where you want it, to make it convenient to use the GPS while charging when you're driving, during working hour or just to leave your phone before bed time..
✅ WORKS WITH ALL YOUR Qi DEVICES: Our Samsung and iPhone compatible wireless charger works with any Qi-Wireless Charging device which include the iPhone 8, 8 Plus, iPhone X, Samsung Galaxy Note 8, S8, S8 Plus, S7, S7 Edge, S6, S6 Edge, Nokia 9, Huawei Mate 10, Nexus 4, 5, Lumia 920 and other QI-Enabled devices. 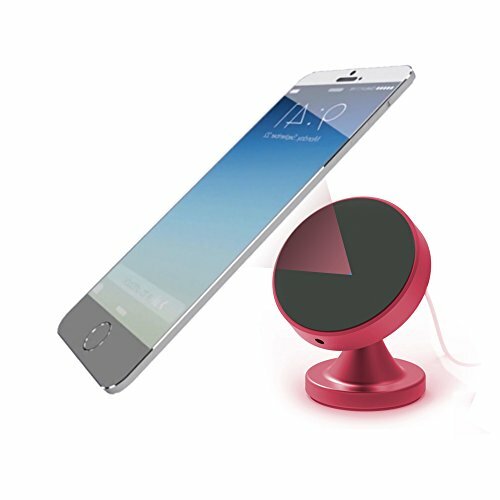 ✅ CASE FRIENDLY: This Nano Technology car mount wireless charger works well with *ALMOST ALL SMOOTH SURFACES* like most popular phone cases, for *ROUGH SURFACES* a thin Clear Pad is provided for best grabbing performance, along with being compatible with Nano Technology, Wireless Charging Case that adds Qi Charging functionality to older phone models to provide super-fast charging without the hassle of dealing with wires. If you have any questions about this product by iNannoh, contact us by completing and submitting the form below. If you are looking for a specif part number, please include it with your message.